I thought I’d post some weird stuff that I found on the internet for absolutely no reason at all. This little beauty is called the Break Up Bean Plant. Because breaking up with someone via text isn’t impersonal enough, why not give your soon-to-be ex this Breakup Bean kit? Plant the bean seeds, and in about five days, actual lima beans will sprout with your breakup message on the leaves. Ain’t love grand? Really, who hasen’t wished for one of those! The Dog Selfie Attachment is self explanatory and pure genius! 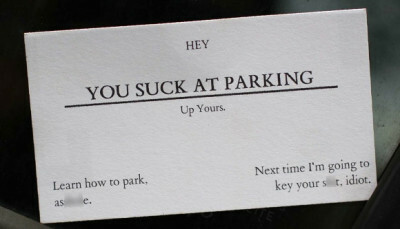 And then there’s the Offensive Parking Business Card for those occasions when you would totally have a great parking space if not for the piggy-parker taking up one and a half spaces. Just leave it on the windshield.